We have gone inland to the Goldfields of Western Australia. 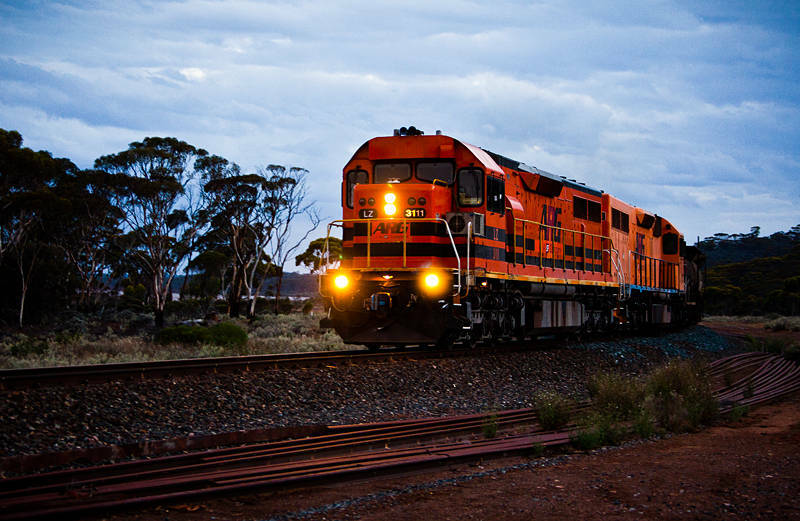 This train passed by our outback campsite last night pulling 135 cars full of ore from the Kalgoorlie mines. We celebrated Karen‘s birthday by checking in to a powered campervan site in Kambalda with hot showers. Tomorrow she has been promised a shopping trip to the gem stone and gold capital of Western Australia. It’s a good thing I start work in three weeks. That’s some fairly vibrant colours there. Did you have to tweak it much or is is just because it’s in early/low light conditions? It was late evening so I boosted Saturation by 31% during processing. Is it the Orange that looks unnatural or the Vegetation / Sky? Actually it’s the colour of the gravel from the rail base. I think they use Green Granite Gravel on the rail base.